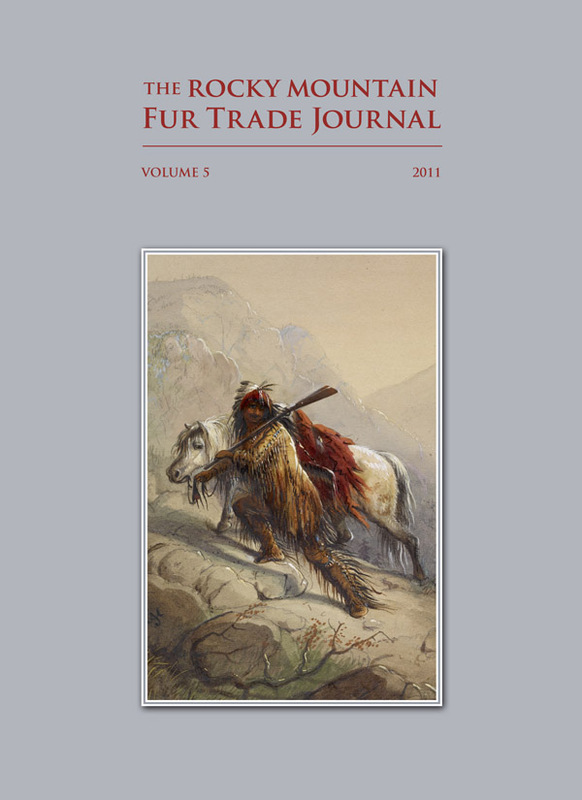 The fifth issue of the Rocky Mountain Fur Trade Journal is now complete and available for purchase online through the trading post . We appreciate all the authors that were willing to submit papers and give this publication a chance. We also owe a debt of gratitude to the peer reviewers who lent us their expertise and credibility. Tracking Jim Bridger: Finding the Trail of Old Gabe – It is time to take a new look at one of the most celebrated figures in the Rocky Mountain fur trade. Was Fort Bonneville Simply Nonsense? Did a Fort Bonneville exist on Wyoming’s Green River during the Rocky Mountain fur trade era? Warren Angus Ferris was the only Green River rendezvous participant to leave a physical description of a Fort Bonneville, or use the term Fort Nonsense. Contemporary fur trade journals, lack of physical evidence, and no verifiable artifacts suggest a bastioned Fort Bonneville did not exist. St. George and the Dragon Sideplate: An Art History for North American Trade Guns – A thorough examination of dragon imagery shows the serpentine design of trade gun sideplates is tied to western artistic traditions. “A Life Wild and Perilous”: Death in the Far West among Trappers and Traders – Dime novels, early “historical” biographies, Hollywood and individuals’ imaginations have often done a great disservice to the accurate reconstruction of the mountain men’s lifestyle by ignoring the risks involved in the occupation and the frequency of death. Research quickly reveals the often brutal conditions in which the mountain men truly worked. Yet it seems that the routine occurrence of death and mayhem in their daily lives is often lost among romantic tales, imagination and persistent myths. Lock, Stock and Barrel: Arming the Far Western Mountaineers – When wielded by men who understood their limitations, muzzle-loading firearms made possible the exploration of the Far West. Myth and Mountain Men Analyzed: Heroes and Heroines – Whether Joe Meek or Luke Skywalker, Kit Carson or Sinbad, the hero adventurer is vital to our social-psychological essence. An 1824-1825 Columbia Fur Company Ledger – A recently discovered ledger adds new light to the business of CFC and some of the men employed in the fur trade of the upper Missouri River. Nathan E. Bender is the Technical Services Librarian at Albany County Public Library in Laramie, Wyoming. As a special collections librarian and archivist, he helped build research collections at the University of Idaho, the Buffalo Bill Historical Center, Montana State University, West Virginia University, and the University of Oklahoma. He has published on western history, folklore, American Indian studies, libraries and bibliography in a variety of academic research journals. O. Ned Eddins is a Doctor of Veterinary Medicine and resident of Afton, Wyoming. He is the author of two historical novels. By horse and pack string, Dr. Eddins has ridden many of the trails described in his books, building his campfires in the same places as those of early mountain men and explorers. Dr. Eddins teaches history workshops for Western Wyoming Community College and is the founder of www.thefurtrapper.com. Jerry Enzler is a historian of the West who is completing a new biography of Jim Bridger. He is the founding director of the National Mississippi River Museum and Aquarium, a Smithsonian- affiliated ten acre campus, and has created and scripted more than fifty museum exhibits including “Lewis and Clark’s Excellent Adventure” and “The Rivers of America.” Enzler is a frequent speaker at national forums, and has appeared numerous times on national television. He lives on the Mississippi River in East Dubuque, Illinois. James Hannon, Jr., of St. Louis, Missouri, is a devoted historian of the fur trade and the early American West. He has presented academic papers at international, national and local history conferences. A member of the American Mountain Men for over thirty years, Hannon has presented programs on mountaineer skills to countless audiences. He works as an information technology manager, and is lovingly supported in his endeavors by his wife and two daughters. Doyle Reid has been involved in historical reenactment for almost thirty years and is a founding member of the Wind River Party of the American Mountain Men. He resides in the Wind River Mountains of Wyoming, in a log home he built with the help of his wife Debbie, son Walter and daughter Heather. An ethnic and environmental historian, Ken Zontek teaches at Yakima Valley Community College (YVCC). His monograph Buffalo Nation: The American Indian Effort to Restore the Bison (University of Nebraska Press, 2007) won the American Library Association’s Best of the Best University Press Award in 2008. He plans a forthcoming study analyzing the impact of the HBC’s “ fur desert” on the inland Northwest. Zontek also founded YVCC’s Afghan Women’s Education Project, a by-product of his ongoing military service in Afghanistan. Rich Aarstad has worked for the Montana Historical Society since 2001. He served as the society’s Lewis and Clark Reference Historian through the bicentennial and served for a short time as the Montana representative on the David Thompson Bicentennials Committee. In 2007, Aarstad co-chaired “Beyond Borders and Boundaries: David Thompson and the North American Fur Trade Symposium” held in Helena. Rich continues his research on Montana’s fur trade, focusing primarily on the period between 1807 and 1820. Bruce Belason lives in the Boston suburbs and for many years performed living history with the Minuteman Company of his town, including pre-dawn marches to Concord to recreate the town’s role the day the Revolutionary War began. After retiring from thirty-eight years as an aerospace engineer, he has continued to pursue a long-time interest in American history, concentrating on the trans-continental expansion and the mountain men/fur trade. Mike Bryant has enjoyed muzzle loaders since 1972. He grew up with visions of Davy Crockett, Daniel Boone, Mike Fink, and Andy Burnett stirring his imagination. Living along the forks of the Yellowstone River, Bryant still marvels at its grandeur. His first rendezvous was the National Association of Primitive Riflemen nationals in 1976, high in the Bitteroots of western Montana, and he has enjoyed reliving the Rocky Mountain fur trade ever since. Jay Buckley, PhD is an Associate Professor of History at Brigham Young University and the author of William Clark: Indian Diplomat (University of Oklahoma Press, 2008), and co-author of By His Own Hand? : The Mysterious Death of Meriwether Lewis (University of Oklahoma Press, 2006). Forthcoming books include: Building an “Empire of Liberty”: Zebulon Pike, Thomas Jefferson, and the Opening of the West (with Matthew L. Harris; University of Oklahoma Press) and A Fur Trade History of the Great Plains and Canadian Prairies (Plains Histories series, Texas Tech University Press). Buck Conner has honed an interest in antique weapon collecting for over 70 years. With his wife, Karen, he has established several period supply businesses for living history aficionados. As a retired senior design engineer in telecommunications, he works and writes intensively in the field of antique firearms. Mr. Conner serves as a consultant in Cabela’s Gun Library and has produced more than 100 articles for trade periodicals. One of his books, Success in the North American Fur Trade, is a history of the Northwest trade gun and its manufacturers. Todd D. Glover, BA, Brigham Young University, recently retired after twenty-five years serving in the military. He has participated in numerous living history events and spends much of his time researching, experimenting and recreating the lifestyle of the historic Rocky Mountain based mountaineers of old. He is a Hiveranno member of the American Mountain Men. Dr. James A. Hanson is a recognized expert on frontier material culture, frequently called on to identify, authenticate, or appraise objects by museums and collectors. He recently completed an appraisal of the one million objects retrieved from the steamboat Arabia which sunk in the Missouri River in 1856 near Kansas City, Missouri. Dr. Hanson is also the author and illustrator of the eight-volume Sketchbook series about voyageurs, buffalo hunters, and mountain men. The most recent of his fourteen published books is When Skins Were Money: a History of the Fur Trade. Hanson, who holds a PhD in American history and anthropology from the University of Wyoming, has done field research on American Indian history and Indian-White relations from Alaska to Mexico and Vancouver to Virginia. His current research project is a six-volume encyclopedia of Indian trade goods; the first volume, “Firearms of the Fur Trade,” appeared in 2010. A popular lecturer and panelist, he is presently historian and editor for the Museum of the Fur Trade in Chadron, Nebraska. Don Hardesty is Professor of Anthropology and Director of the Historic Preservation Program at the University of Nevada, Reno. His research interests have focused on the archaeology and history of the American West from Alaska to California, overland emigration, frontier mining settlements, and historical landscapes and environments. His publications include: The Archaeology of the Donner Party; The Archaeology of Mining and Miners; Ecological Anthropology; and Assessing Site Significance: A Guide for Archaeologists and Historians (with Barbara Little). John C. Jackson wrote the first fully-documented biography of David E. Jackson, Shadow on the Tetons. He is the co-author, with Thomas C. Danisi, of Meriwether Lewis. A graphic designer for twenty years in Portland, Oregon, Jackson has written books on Metis in the Pacific Northwest, Piikani Blackfeet, Indian wars and Indian politics. His most recent book, about John McClallen, is By Honor and Right: How One Man Boldly Defined the Destiny of a Nation. Clay Landry is an avid researcher, whose study and writing on the material culture items used by the men of the Rocky Mountain fur trade has resulted in numerous published essays. A registered researcher with the Fur Trade Research Center, Landry has presented papers on fur trade material culture at numerous fur trade symposia. He has conducted demonstrations and seminars on mountaineer clothing, food, horse gear and trade goods at various national historic sites throughout the West. William Swagerty’s interest in the fur trade of the Far West was sparked by Harvey L. Carter’s course on the American West at Colorado College in 1971. He has taught college-level American history since 1977 and has presented papers at many fur trade symposia over the past thirty years. Swagerty is especially interested in the labor and social histories of fur trade personnel, including employment histories, marriage, and retirement patterns. A second interest is the material culture of the fur trade, especially blankets and trade cloth. He currently is director of the John Muir Center and professor of history at University of the Pacific, Stockton. Tim Tanner was educated at Utah State University and the California Art Institute, and embarked on a career as an illustrator in 1989. His artwork has graced the pages of national bestsellers and popular magazines, including publications from Simon & Schuster, Ballantine Books, Bantam, Dell, Doubleday, Reader’s Digest, Outdoor Life, and Field & Stream. An avid historian and fur trade re-enactor since the late 1970s, Tanner is a member of the American Mountain Men, and a founding member of the American Longrifle Association. Tanner is on the art faculty at Brigham Young University/Idaho and makes his home in “Pierre’s Hole” (Teton Valley), Idaho. Jack Tykal, a lifetime Westerner, has lived in Utah since 1982. He spent two years in the U.S. Army, seven in banking, and more than twenty years working for the FBI. Since retiring, Tykal has published several books and articles on western history, including Etienne Provost: Man of the Mountains; “Taos to St. Louis: The Journey of Mariá Rosa Villalpando” in the New Mexico Historical Review; and Journal of an Expedition to the Grand Prairies of the Missouri, 1840. Dave Vlcek has worked as a professional archaeologist in southwestern Wyoming for over thirty years. Mr. Vlcek’s specialties are prehistoric settlement patterns of the upper Green River Basin, remote sensing applications in archaeology, aspects of the fur trade, and the national Historic Trail system in western Wyoming. Vlcek also lectures on southwestern Wyoming’s fascinating history and archaeology to school groups, to residents of Sublette County and to his professional peers on a regular basis.